With the growing momentum of raids, the’ pressure’ on the local Food Safety Teams is increasing. The failure of attempts to keep the inspecting teams away by “paisa or sifaarish“ was followed by verbal and physical duels and even manhandling of teams at a couple of places, by the unscrupulous elements. Hence to safeguard the teams, to boost their morale and to purge the food chain eco-system of the adulterators, special flying squads have been constituted and request has been made to the District Magistrates to tie up at local level to rope in CIA staff in the raids, as and when required, informed KS Pannu, Commissioner Food and Drug Administration, Punjab.If the campaign against adulterators has to reach a conclusive end then handholding of the inspection staff is a must, said Pannu and added that from now onwards the raids would not necessarily be conducted by a local team but where ever desired Assistant Commissioners Food(ACFs) from other districts would also be mobilized on directions of head office, with no one at local level knowing who or for that matter how many other ACFs would join the raid. On this basis, by coordination with the local Deputy Commissioner raids were conducted in Sangrur wherein along with the local Food Safety Team and the dairy development officers, ACF and Dairy officers from Patiala, Ludhiana and Mansa together with CIA staff, Sangrur raided three dairies in Ahmedgarh. All these dairies supplied MMP to Ludhiana. At, Vijay Milk Centre 500 litres of milk, 105 kg paneer and 100 kg khoya , at Billu Dairy 200 litres milk,90 kg paneer, 35 kg khoya and at Khushi milk Centre 800 litres milk, 60 kg paneer and 45 kg khoya amounting to 1500 litres milk, 155kg paneer and 180 kg suspected substandard MMP was found. Samples were taken by the team and sent for analysis to the State Lab. The raids concluded at around 2:00 am in the morning, which speaks volumes of sincerity of the Food Safety Teams and that of Tandrust Punjab Mission.Earlier, a raid was conducted by Hoshiarpur Food Safety Team at the house of FBO who fearing action had changed his modus operandi and was working from his house without any license for the same. 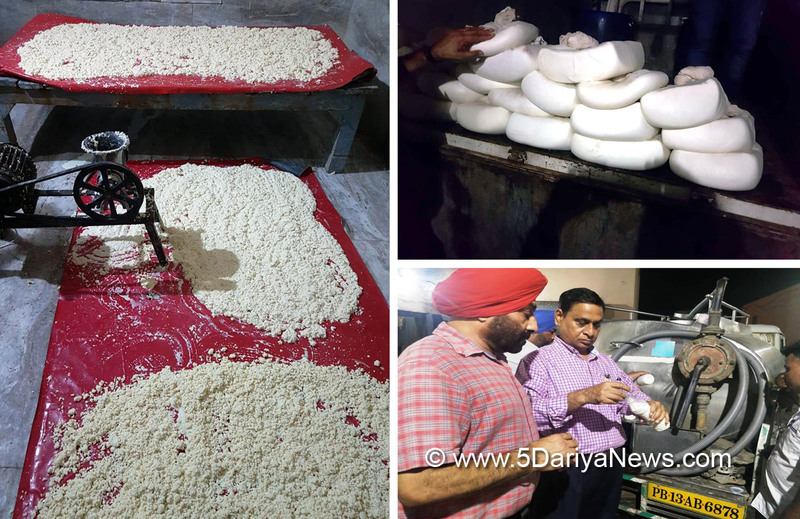 In this early morning raid along with Deputy Director Dairy Development about 150 kg of sub standard paneer was found. Similarly, about 15 kg of foul smelling stale sweets were found on a sweet shop and destroyed on the spot.